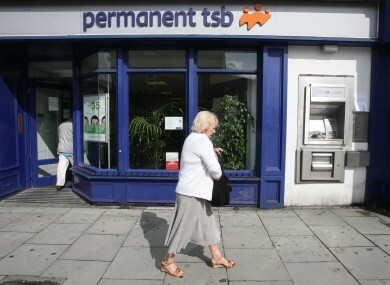 PERMANENT TSB has welcomed the government and Troika’s approval for its restructuring plan which will see its loan portfolio split and the creation of a separate Asset Management Unit. Under the plan, which PTSB says it will submit to the European Commission by the end of June, the bank’s loan book will be divided into performing and non-performing loans. The group’s UK operation will continue as a stand-along unit within the overall group with a loan book of around €7.1 billion. PTSB’s loan book will be around €14.2 billion, and the new asset management wing AMU will have a book of around €12.5 billion. Speaking about the latest Troika review of Ireland’s bailout agreement today, Finance Minister Michael Noonan said that PTSB has the makings of a sound, profitable, retail bank and it would be a tragedy if it is not made profitable again. “The objective of this plan is to create a viable retail bank focused on lending into the Irish economy,” he said. Fianna Fáil’s finance spokesperson Micheal McGrath TD said that the bank’s restructuring provides an opportunity to introduce a reduction in the interest rate the bank is charging on its standard variable rate mortgages. “The penal interest rate being charged is crippling thousands of ordinary Permanent TSB customers around the country, who are effectively trapped because they can’t transfer their mortgage to other banks,” he said today. Email “PTSB to 'carve viable business' out of current bank”. Feedback on “PTSB to 'carve viable business' out of current bank”.